Studies show that it is very important to reduce job stress and depression of nurses. The main objective of this study was to explore the role of humor in reducing job stress and depression among nurses. The study took place at hospitals in Iran. After distributing questionnaires, 210 accurate questionnaires have been used for data analysis. This research was conducted using three separate Questionnaires: Humor (Khoshouei et al. 2009), stress (Cohen, Kamarck, and Mermelstein, 1983), and depression (Radloff, 1977). Structural Equation Modeling (SEM) was conducted to examine the relationship between humor, job stress and depression. The finding showed that humor has a negative impact on job stress and depression with a significant path coefficient at -0.65 and -0.76. In addition, Job stress has a positive impact on depression with a significant path coefficient at 0.71. The results of research showed that humor could be considered as a predictor of reducing job stress and depression and job stress could be considered as a predictor of depression. Concerning to the work related stress, health professions were forgotten for a time but recent research has contributed to include these practitioners in the group of the most exposed to stress due to the particular characteristics of their job (Amaro and Jesus, 2008). It is important to recognize that stress is a state, not an illness, which may be experienced as a result of an exposure to a wide range of work demands and in turn can contribute to an equally wide range of outcomes, which may concern the employee’s health and be an illness or an injury, or changes in his/her behavior and lifestyle (Moustaka, and Constantinidis, 2010). Many research projects have been done to study the antecedences of stress and depression so far. Stress management and reducing the stress in individual is a key concept in organizational behavior. One of factor that has an impact in reducing the stress and depression is humor. Humor has been recognized in the literature as a complex and personal phenomenon regarding its multidimensional nature and the different meanings that people attribute to the concept. Thereby, although this complex concept has been largely studied by the health and social sciences, no commonly accepted definition was suggested (Santos and Jose, 2012). Romero and Cruthirds (2006) define humor as “amusing communications that produce positive emotions and cognitions in the individual, group, or organization”. In the management literature, humor is defined as a message whose ingenuity, verbal skill, and/or incongruity has the power to evoke laughter (Bergeron, and Vachon, 2008). Although there are examples of studies of humor, the literature is most often conceptual, and does not empirically examine the value of humor for service organizations. The aim of this research is to study the role of humor in reducing job stress and depression among nurses. (4) There are positive and negative humor styles. 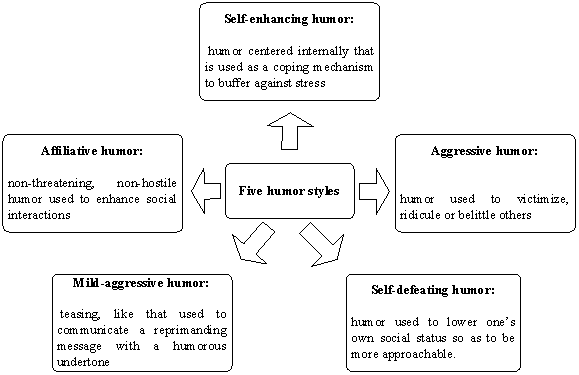 In Figure 1 the five humor styles has been displayed. Research supports humor as an excellent stress management tool. Many people find that maintaining a sense of humor is useful for a good quality of life. Sense of humor gives the ability to find delight, experience joy, and release tension. Studies show the existence of an intrinsic connection between humor and the stress level (Santos and Jose, 2012). The results of the study previously carried out by Astedt-Kurki and Liukkonen (1994), indicated that humor takes an important role on the management of work related stress. Humor and laughter are a powerful emotional medicine that can lower stress, dissolve anger, and unite people in troubled times. Humor in the workplace has been identified as beneficial (Hoption et al. 2013). Having a great sense of humor provides many clear advantages. It increases energy and gives a feeling of well-being by stimulating the release of chemicals, such as endorphins and adrenaline (Miller, 1996). It decrease depression, anxiety and stress, as well as enhance one’s mood, immunity to illness, and life/family satisfaction. 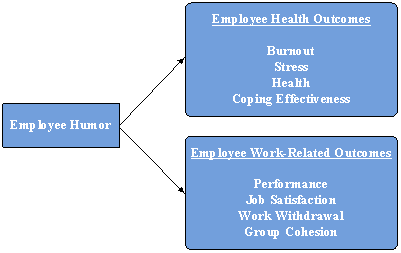 As you can see in Figure 2, employee humor has impact in employee health like burnout, stress, health and coping effectiveness. Depression among nurses may be linked to the high level of their stress. Nurses can be a high-risk occupational population for experiencing depressive symptoms because of high job demands and complex environmental conditions (Gelsema et al., 2005). Literature review shows that stress has a significant association with depression (Chiang and Chang, 2012). H3: Job stress has a positive impact on depression. On the basis of theoretical background the following conceptual model is developed. A survey/questionnaire research was conducted to test the research hypothesis. The study took place at hospitals in Iran. Data were gathered from self-reported questionnaires by 210 nurses. Regarding the demographic information, most participants were female (60 percent), age from 20 to 50 years old, 70 percent were married, working tenure between 1 to more than 10 years, and all of them were academic educated. The characteristics of the participants are described in Table 1. This research was conducted using three separate instruments. Humor was assessed using the Sense of Humor Questionnaire (SHQ) developed by Khoshouei et al. (2009). The SHQ is a 25-item, 5-points Likert-type scale (1 refers to strongly disagree and 5 refers to strongly agree). Stress was assessed using the Perceived Stress Scale, 10-item version (PSS-10) (Cohen, Kamarck, and Mermelstein, 1983). In this scale the response options range is from 0 (never) to 4 (very often), with higher scores indicating greater stress. Depression was assessed using the Center for Epidemiological Studies Depression Scale (CES-D) (Radloff, 1977). The CES-D is a 20-item, 4-point Likert-type scale (1 refers to rarely or none of the time and 4 refers to most or all of the time). Cronbach’s alpha was used to estimate the reliability of internal consistency. Table 2 shows the reliability of questionnaires. As you can see in Table 2 none of the reliability estimates fell below 0.70, so the scale reliabilities were considered acceptable. After testing the reliability of the questionnaires, the measurement models and research hypotheses was tested. For this purpose, structural equation modeling was conducted to test the hypotheses and to examine the relationships among the variables. We relied on several statistics to evaluate the goodness-of-fit of the models that includes: RMSEA, GFI, NFI, CFI and CMIN/df. Two statistical programs, SPSS 18 and Amos 21, were utilized to conduct the data analyses. First three measurement models were separately analyzed. Table 3 shows fit indices of the measurement models. Comparing the amount of fit indices and their acceptable amount shows that overall fit of the measurement models is acceptable. For testing the research hypotheses, structural equation modeling has been used. Table 4 shows the fit indices of the structural model. The results in Table 4 shows the values of fit indices all reach the acceptable amount. Two indices named critical ratio (CR) and P have been used for testing the significance of hypotheses. If CR>1.96 then in the significance level of 0.05 are confirmed the hypotheses. Table 5 shows the hypotheses and regression coefficients. Job stress has a positive impact on depression. As Table 5 shows, humor has a negative impact on job stress and depression with a significant path coefficient at -0.65 and -0.76. In addition, Job stress has a positive impact on depression with a significant path coefficient at 0.71. Higher level of workloads with limited amount of nursing staffs can cause a variety of negative outcomes such as work stress and depression (Chiang and Chang, 2012) so it is very important to reduce job stress and depression of nurses. The main objective of this study was to explore the role of humor in reducing job stress and depression among nurses. Another objective of this research was to determine the effects of job stress on depression. The finding showed that humor has a negative impact on job stress and depression with a significant path coefficient at -0.65 and -0.76. In addition, Job stress has a positive impact on depression with a significant path coefficient at 0.71. The results of research showed that humor could be considered as a predictor of reducing job stress and depression and job stress could be considered as a predictor of depression. This research creates an important implication for managers of organization. The results of this study state that having a sense of humor is a powerful way to reduce job stress and depression. As previous researches showed employee humor is associated with enhanced work performance, satisfaction, workgroup cohesion, health, and coping effectiveness, as well as decreased burnout, stress, and work withdrawal (Mesmer-Magnus and Viswesvaran, 2012). Creating a humorous workplace is an important factor that must be considered by managers of organizations. Employees with a sense of humor and a humorous workplace can reduce job stress and depression among nurses. The main limitation of this research was the nurses’ lack of time in responding to the questionnaires. This research aimed to analyze the role of humor in reducing job stress and depression among nurses; the study can be performed in the other organizations and other countries for more confirmation of results. Amaro, H., and de Jesus, S. N. (2008), Vulnerabilidade ao Stresse em Profissionais de Emergência Médica Pré-Hospitalar, Mudanças – Psicologia da Saúde, 16, 62-70. Astedt-Kurki, P., and Liukkonen, A. (1994), Humor in nursing care, Journal of Advanced Nursing, 20, 183-188. Bergeron, J., and Vachon, M. A. (2008), The effects of humor usage by financial advisors in sales encounters, International Journal of Bank Marketing, 26(6), 376 – 398. http://dx.doi.org/10.1108/02652320810902424. Chiang, Y. M., and Chang, Y. C. (2012). Stress, depression, and intention to leave among nurses in different medical units: Implications for healthcare management/nursing practice, Health Policy, 108, 149– 157. http://dx.doi.org/10.1016/j.healthpol.2012.08.027. Chinery, W. (2007), Alleviating stress with humor: a literature review, Journal of Perioperative Practice, 17, 172-182. Cohen, S., Kamarck, T., and Mermelstein, R. (1983). A global measure of perceived stress. Journal of Health and Social Behavior, 24, 385–96. http://dx.doi.org/10.2307/2136404. Jones, D., Tanigawa, T., and Weisse, S. (2003). Stress management and workplace disability in the U.S., Europe, and Japan. Journal of Occupational Health, 45, 1-7. http://dx.doi.org/10.1539/joh.45.1. Lambert, V. A., and Lambert, C. E. (2008), Nurses’ workplace stressors and coping strategies, Indian Journal of Palliative Care, 14, 38-44. http://dx.doi.org/10.4103/0973-1075.41934. Mesmer-Magnus, J., Glew, D. J, and Viswesvaran, C. (2012), A meta-analysis of positive humor in the workplace, Journal of Managerial Psychology, 27(2), 155 – 190. http://dx.doi.org/10.1108/02683941211199554. Moshref Javadi, M. H., Salehzadeh, R., and Hoseini poor, S. (2013).Studying the Relationship between Humor and Organizational Citizenship Behavior, International Journal of Academic Research in Accounting, Finance and Management Sciences, 3(3), 146-151. http://dx.doi.org/10.6007/IJARAFMS/v3-i3/100. Moustaka, E., Constantinidis, T. C. (2010), Sources and effects of Work-related stress in nursing, Health Science Journal, 4(4), 210-216. Radloff, L. S. (1977), The CES-D Scale: a self-report depression scale for research in the general population. Applied Psychological Measurement, 1, 385–401. http://dx.doi.org/10.1177/014662167700100306. Romero, E. J., and Cruthirds, K. W. (2006), The use of humor in the workplace, Academy of Management Perspectives, 20(2), 58-69. http://dx.doi.org/10.5465/amp.2006.20591005. Santos, M. I., and Jose, H. (2012). Humor and Health Practitionaires’ Stress, Humor contributions in stress management, Advanced Research in Scientific Areas, 1022-1026. "Role of Humor in Reducing Job Stress and Depression." UKEssays.com. 11 2018. All Answers Ltd. 04 2019 <https://www.ukessays.com/essays/psychology/role-humor-reducing-job-stress-9825.php?vref=1>. "Role of Humor in Reducing Job Stress and Depression." All Answers Ltd. ukessays.com, November 2018. Web. 24 April 2019. <https://www.ukessays.com/essays/psychology/role-humor-reducing-job-stress-9825.php?vref=1>. UKEssays. November 2018. Role of Humor in Reducing Job Stress and Depression. [online]. Available from: https://www.ukessays.com/essays/psychology/role-humor-reducing-job-stress-9825.php?vref=1 [Accessed 24 April 2019]. UKEssays. Role of Humor in Reducing Job Stress and Depression [Internet]. November 2018. [Accessed 24 April 2019]; Available from: https://www.ukessays.com/essays/psychology/role-humor-reducing-job-stress-9825.php?vref=1.